The final league encounter of the RuPay Pro Volleyball League 2019 will see U Mumba Volley take on Ahmedabad Defenders at the Jawaharlal Nehru Indoor Stadium in Chennai. U Mumba Volley registered their first win of the season two days ago when they defeated Chennai Spartans 3-2 in Chennai. Skipper Deepesh Kumar Sinha led the side from the front, racking up 11 points, including four points from his service. Ahmedabad Defenders have not won a single match out of their four encounters in the league and find themselves playing for pride. Although they are out of the competition, the Ranjit Singh-led side will have a major say in who gets the final spot in the semi-finals - U Mumba or Black Hawks Hyderabad. U Mumba Volley had a poor start to their season when they succumbed to a 1-4 defeat at the hands of Kochi Blue Spikers on the opening day of the RuPay Pro Volleyball League. The next two matches saw them do well and provide a tough fight to the Calicut Heroes and Black Hawks Hyderabad, but the win continued to elude them as they lost both matches 2-3. 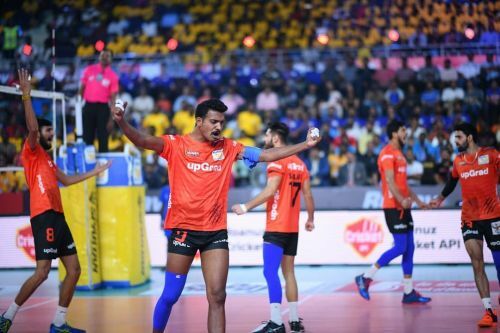 A change in venue from Calicut to Chennai brought a change in fortunes for the team as they defeated the hosts, claiming the first three sets of the match in convincing fashion. U Mumba Volley have a chance of making it to the final four if they overcome the Ahmedabad Defenders. Ahmedabad Defenders, meanwhile, will be looking to end the season on a high by grabbing a consolation win on the final day of the league matches. The performance of the captains - Deepesh Kumar Sinha for U Mumba Volley and Ranjit Singh for the Ahmedabad Defenders will be a key factor on the night. U Mumba Volley - Deepesh Kumar Sinha (c), Vinit Kumar, Prince, Tomislav Coskovic, Pankaj Sharma, Saqlain Tariq. Ahmedabad Defenders - Ranjit Singh (c), Viktor Sysoev, Mandeep Singh, GR Vaishnav, Novica Bjelica, Gurinder Singh.